Ready for the next generation in Jazzy® Power Chairs? The Jazzy Select® 6 2.0 is a sleek and modern addition to the Jazzy Power Chair lineup! Get the same great performance you love in a sporty package! 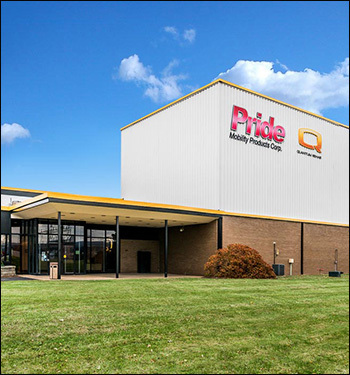 The Jazzy Select 6 2.0 is equipped with Pride’s patented Active-Trac® Suspension and Mid-Wheel 6® drive design, ensuring a smooth and comfortable ride with a tight turning radius. This electronic wheelchair is a great choice for both indoor and outdoor use. The suspension and casters provide the performance and stability you need for uneven terrain. The mid-wheel drive configuration allows you to easily turn around corners and smoothly transition through the doorways of your home. The Jazzy Select 6 2.0 has a foot platform that is height adjustable and flips up easily when not in use. Get the foot space you need for greater comfort. The vinyl, black, high-back, limited recline seating is depth adjustable for complete comfort. This seat also folds flat for total convenience, allowing you to easily store this electronic wheelchair when not in use. The seat offers replaceable back and seat covers as well. 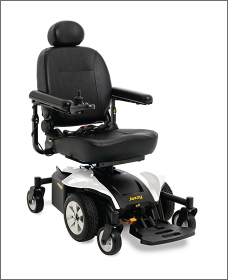 In addition, the Jazzy Select 6 2.0 is available with optional seating to fully meet your needs. With a 300-pound weight capacity, the Jazzy Select 6 2.0 is a great choice for a range of individuals who need help getting around. Whether you have a disability, are recovering from an injury, or just need a little extra mobility in your life to complete daily tasks, this power wheelchair is just what you need! For a touch of style, this electronic wheelchair is available in four different shroud colors. Choose from Sapphire Blue, Ruby Red, Pearl White or Black Onyx. Pick the shroud color that best matches your taste and personality. If you’re looking for a motorized wheelchair that is reimbursable through Medicare, the Jazzy Select 6 2.0 may be covered by Medicare if you qualify. Get more information on Medicare coverage for power wheelchairs. Still not sure if the Jazzy Select 6 2.0 is the one for you? Check out our product page for even more information or find a local dealer today! Learn more about the Jazzy Select 6 2.0.